The fact is having 30high PR social links to your website, from 30 different, trusted and high traffic Social sites, is the perfect way to begin any whitehat SEO campaign. They are also diverse, very few people use these platforms as part of their SEO, this is because they have to be hand built, and no automation for 99% of these sites is available. Bonus: I will provide few Extra high page rank Links as Bonus. 100-300 word description about your Company or Business. You will get full LOG in DETAILS. 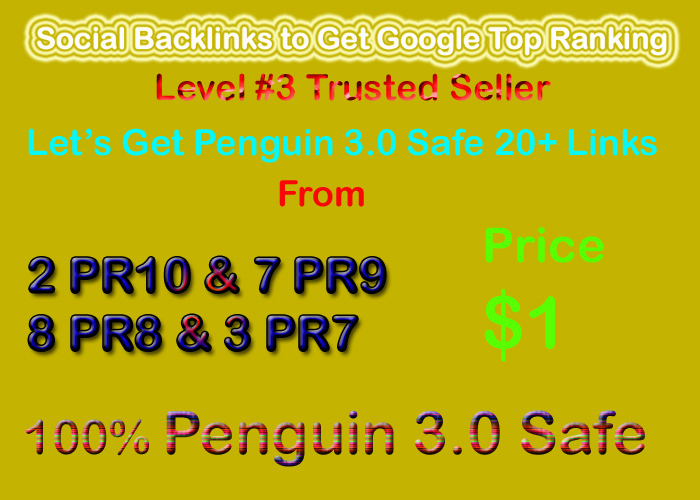 Manual Penguin Safe 30 Social Profile Links from DA60+ or PR6-PR10 is ranked 5 out of 5. Based on 919 user reviews.